We just finished Week 7, and Lecture 27, in Economics 1 with a midterm exam coming up next week. What a great time to be teaching and learning economics, with the questions about the bailouts and the top 1 percent coming out of OWS, debate over another stimulus package, the debt crisis in Europe, presidential candidates proposing major tax reform, and great sports examples, especially at Stanford with football nationally ranked at No 2 in the USA Today poll and No 3 in the AP top 25. Of course that’s a learning experience not only for the fans and players in class who have to allocate scarce time to prepare for the Stanford-Oregon game tomorrow and the midterm next week, but also for anyone who wants to understand markets and the role of prices in allocating scarce resources, namely tickets to the crucial game tomorrow. 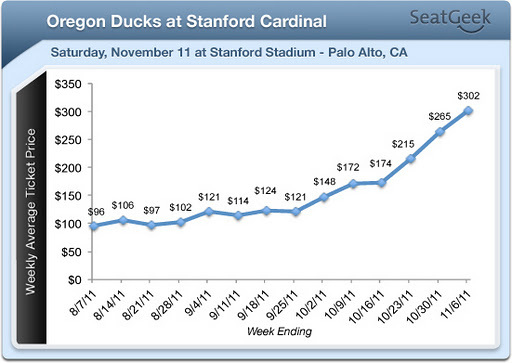 The price of tickets to the game has exploded in the seven weeks since the term started. As the chart shows the price of an average ticket has gone from $124 when we started the course to $302 now, an increase of 142%. Some tickets are going for as a high at $650 today according to StubHub.